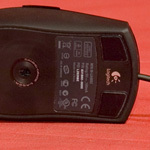 As the naming suggests, the G3 is meant to be un upgrade on the G1 in Logitech's recent series of gaming mice. 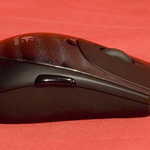 While it retains Logitech's distinctive shape, perfect for either left or right handers, Logitech have added two extra buttons, one on either side, and changed the optical sensor to a 2000 DPI laser. Logitech also bump up the USB rate by default on this mouse, to 500 Hz. The body of the mouse has a similar holographic effect as the MX518, but this time to simulate horizontal ripples. I find this effect more pleasing than the dented look of the MX518 but your mileage might vary. 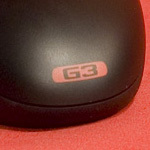 Logitech have also decided to stamp G3 in bold red on the back of the mouse, I assume for the sake of reviewers that have too many similarly shaped mice on their desk and can't tell them apart. 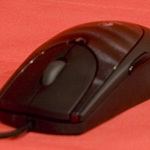 Since the laser doesn't emit any visible light, there's no glow effect with the mouse. Since this is meant as an upgrade to the G1, we'd hope to see better performance in this mouse. However as we've seen for other brands, the laser sensors don't quite cut it at high speeds. 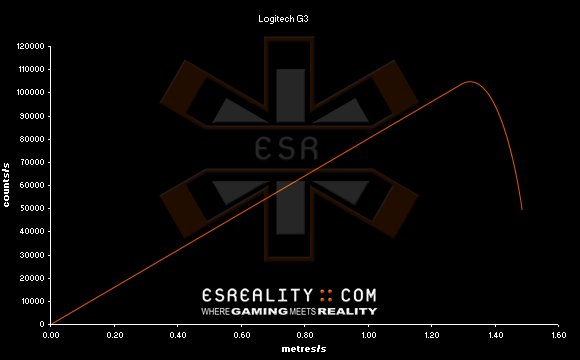 The G3 has Perfect Response up to 1.30 m/s (51"/s) and gets to its Malfunction Speed at 1.35 m/s (53"/s). The resolutions is indeed 2000 DPI, as we expected. The G3 would not be good for gamers using Low Sens. As laser sensors go, this one is better than Microsoft and Razer's efforts. However unless you have a very high game sensitivity and really need the 2000 DPI resolution, the G1 is a far better choice in terms of value for money and performance in the same body shape.